Style authorities like to talk a lot about building your suiting wardrobe, your shoe lineup, or even your watch collection, and for good reason: those pieces can do a lot to elevate your style, and allow you to present your best self to the world. But let us just take this opportunity to say: your basics matter too. For example, you’d be surprised how much a thoughtfully curated t-shirt collection can improve your style game. A comprehensive and well-fitting lineup will create endless outfits for you to reach for, and ensure you always look on point, even if you’re just heading to the grocery store. Here, the four types of T-shirts every man should own, plus thoughts on the number of options to keep on hand for maximum styling opportunities. It’s more than one or two but remember: unlike your tailoring, these buys can be worn, washed, and worn again. In fact, that only makes them better. Basic crew neck t-shirts are the most versatile and essential type of t-shirt you can own. For that reason, we say build a stack that’s at least 15 tees deep. That may sound like a lot but let’s do the math. You want one in white, navy, black, and gray. You want just as many colors in there too, from pink to olive and even stripes. And then you want a few different cuts to play around with as well. Long sleeves for winter days, short sleeves for the other three seasons. A boxier cut for your sweats, a slim cut for your suits. You get the idea. 15? Yeah, that’s nothing. We’re not against V-neck tees by any means but if you want to talk about a clavicle-revealing tee, the Henley is king. There’s just something about the smart button placket and classic cut of the Henley that makes every man look his best. Because of that, you can wear this t-shirt everywhere from the gym to a nice restaurant and to the office. We say keep at least 4 or 5 on hand at a time, in classic neutrals, at least one stripe, and whatever color people tell you “brings out your eyes”. Graphic tees are deeply personal, so who are we to tell you how many you should own? We will say this: they can and should do more than shout out your alma mater. From political statements to sports team names, brand logos (ahem) to just plain cool designs, there are many ways to express your style through the graphic tee. Right now, we’re into motocross and throwback athletic graphics on long-sleeve tees—they’re exactly what you want to wear with sweats or track pants and sneakers on chill-mode days. 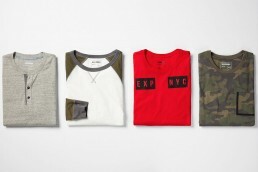 Speaking of athletic inspiration, don’t sleep on the raglan tee. Whether you go for the baseball-inspired contrast sleeves or just a simple solid color is your choice to make—either way this cut will make your arms and shoulders look like you’ve been spending some extra QT at the gym. Did we mention they’re comfortable too? We even make them in moisture-wicking performance fabrics, so you can enjoy the freedom of movement during workouts and outdoor activities like skiing, snowboarding, and you know, shoveling the snow off your car. Don’t forget: the T-shirt’s essential purpose is to help you live your everyday life with style. The good, the bad, and the daunting.